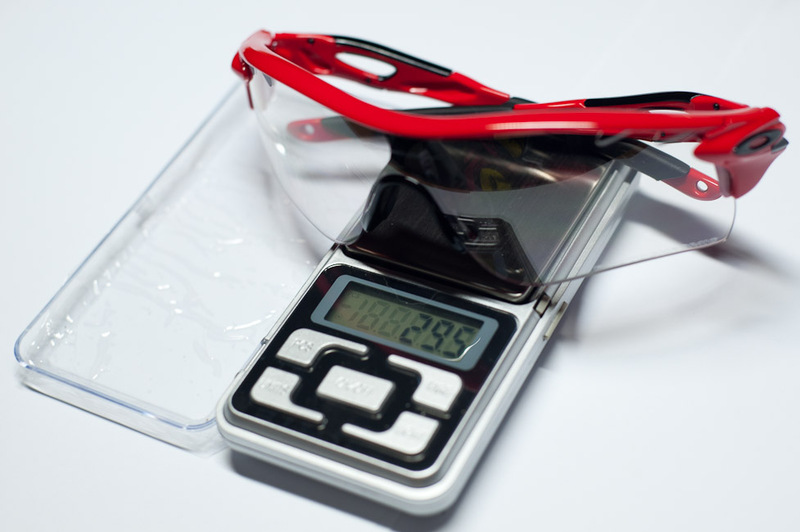 Weight of Oakley Sunglasses. A weight weenie request. I have been asked by a fellow cyclist to do this comparison and so here it is. As you can see, the RadarLock is heavier than the Racing Jacket. But don’t be fooled by this outright comparison as there are other parameters that changes the feel of this weigh-in. The Controversy of Heavier Sunglasses. I know I know, review over. Racing Jackets are lighter. But wait, eventhough the physical weight of the RadarLock is outright heavier than the Racing Jackets, this does not necessarily mean that it feels heavier once you wear them. It all comes down to the issue of fitment and pressure. Bear with me on this. Its obvious that weight will cause the sunglasses to feel heavy if options 2-4 stays the same. Meaning, between two identical sunglasses with different materials and weight, then the lighter will feel lighter. Sorry for pointing out the obvious, but this will change as you read on. However, between different glasses, the parameter “fit” comes into play because this changes the way the sunglass hugs your face. Its something like holding onto a baby. If the baby hugs you back when you pick the baby up, you’ll feel as if its much lighter. So a sunglass that fits your face better will put the right pressure at the right places and you don’t feel it poking into you, especially if you wear it for a long time. Comfort in the long run comes from a well fitting sunglass as it does not put any stress on your face. This brings the third parameter of surface area touching your head into contention. Some sunglasses are designed with larger pads, or bridge touching your ears, increasing the surface area in contact with your skin (and it also helps with a proper fit). Since pressure equals to force divided by area, the higher the area in contact with your head, the lower the pressure is applied to your skin. All this will mean your skin feels lesser force on it, and the sunglass feels lighter. Add to that the fact that the bigger the surface area, the bigger the friction force the sunglass has with your head, and thus providing a feel that if will not slip from you when you move around. This feeling makes you psychologically feel as if you can now do higher G-force activities without worrying about the sunglasses falling off. Also, the shape of the pads are important as it relieves stress points if its rounded, or increases stress points if its pointy. In this case, rounded fat bits are great for comfy, comfy, comfy. 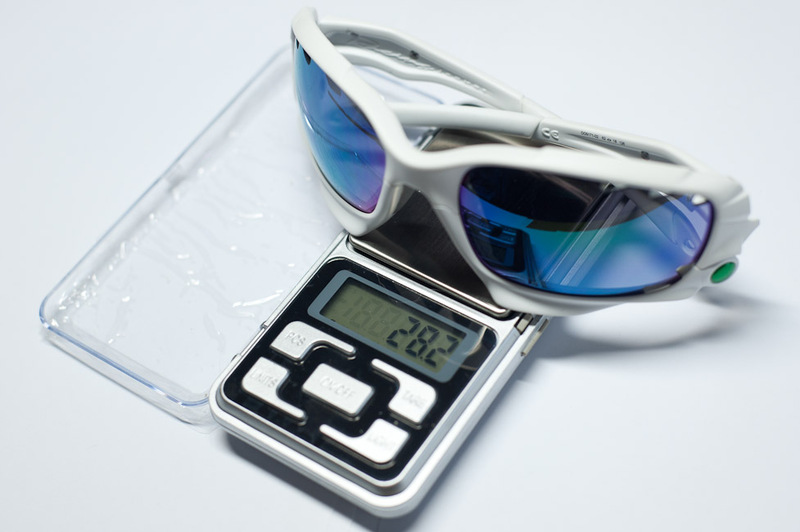 The last parameter of balance point is one of the most important part of how a sunglass feels on you. If the sunglass has a centre of gravity concentrated more forward towards the bridge/your nose, you will feel as if the sunglass wants to slide off your nose, especially when you are leaning forward or perspiration makes it slippery. This is most prevalent in sunglasses with very little material in the temples. This pushes the centre of gravity forwards as the lenses, frame, notepad and bridge makes up the most material. With so much mass at the front, its all out of balance and feels tippy toed. With a thicker bridge design, like the RadarLock, moves the centre of gravity backwards, evens out the pressure on the nosepads and temple tips on your ears. This also does another thing. WIth the centre of gravity further back, and closer to your rotational axis of your head (which is at the meeting point of your spine and your skull), this lowers the torque produced when you turn your head left or right. So now you can turn your head faster without producing a centrifugal force large enough to throw your sunglasses out tangentially. This is very important in the aspect of performance sports where spatial awareness is important and quick sharp moves of the head to see what is around you is a norm. It fits me better, not necessarily you though. So this brings us to Oakley’s RadarLock and Racing Jackets. For me, the RadarLock fits me better than the Racing Jackets. I find that the Racing Jackets don’t sit right onto my nose and it somehow doesn’t hug me like the RadarLocks do. Also, the nosepads on the RadarLock just does it for me. Most of the real estate just clings onto my nose and this makes it way more comfortable than the Racing Jackets. RadarLock feels lighter than Racing Jacket. To me at least. And surprise surprise, I feel as if the RadarLock’s are weightless. It feels so much lighter than the Racing Jackets. I would have thought the RadarLocks were really lighter in weight before I weighed them. And you see those thick temples on them, it doesn’t feel like the specs are hanging for dear life on your nose. Instead, it feels well balanced and no matter how I twist and fling my head, the RadarLock’s sticks to me. I reckon the thicker temples distributes the weight better on my head. I think the Racing Jackets will feel lighter on another person if the fit is better. And with the real physical weight being much lower, weight weenies should go check out the Racing Jacket’s. For a loss of 1.3g and being cheaper than RadarLock, in the world of road cycling.. priceless!